Sovereigns of Lost Alara was the defining centerpiece to a powerful strategy. But it’s not really that big for its cost. I mean… 4/5 for six? That barely qualifies as a fatty. Now 4/5 for four might be more like it. 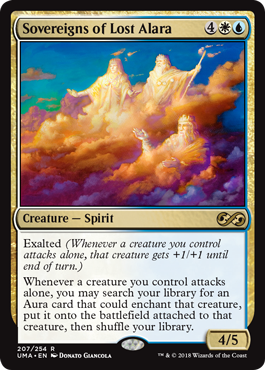 Well… Sovereigns of Lost Alara did have Exalted. When attacking alone, it was more of a 5/6 for six, right? Sure, sure. But maybe more importantly, its Exalted had “haste”. Like, if you had a creature already in play, it could attack and get the Exalted. What about 15/16 for six? Fifteen-sixteen? What are you talking about, Willis? How about you go and get Eldrazi Conscription? Oh yeah, there’s that second clause after “Exalted”. If you attacked with a creature alone — Sovereigns or someone else — you could search your library for an Aura and play it for free. It just made sense to play a huge one that had a huge impact on the game (that you wouldn’t normally want to pay retail for). Enter: One of the most successful Standard decks of its era.